Not Quite Ready for Bathing Suit Season? Pedometer Program to the Rescue! Summer is coming and the beach is calling your name! Hesitant to go bathing suit shopping or try on last year’s buy? Start on our pedometer program today and you’ll be seeing the results and slipping into that suit in no time. Body image is important because it affects the way we live on a daily basis. Having confidence in the way you look is a positive asset, but your self image should start from the inside out and be a result of a healthy lifestyle; that way, it is genuine, long-term and you don’t just look great… you feel great too! What Can a Pedometer Program Offer Me? 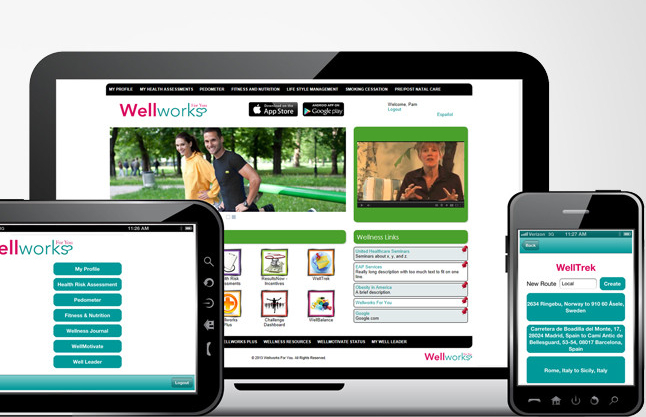 Wellworks For You’s pedometer program is a specially designed service for employees participating in their company’s wellness program. This pedometer challenge is fun and engaging and will get you up and moving. But don’t sweat it – the program is designed so that you can take it all at your own pace and set and achieve personal goals within the context of an encouraging workplace community. Workplace pedometer programs can help you increase your physical activity in an easy and measurable way. Taking part in the program means you will receive personal step tracking tools and the ability to report your progress on our online tracking system. Our online tool, WellTrek, allows you to design your own personal walking routes by giving you access to our extensive virtual map. The map covers the United States, Europe, and Canada and is so specific it even includes public walking paths in your area! Keeping track of your progress during the pedometer program is easy and fun. Plot your journeys on the map, count calories and track miles to your final destination. Setting goals for yourself is beneficial both physically and mentally and taking part in a pedometer challenge is a great way to set and achieve some goals! Here at Wellworks for You, we want to help employees make better life decisions about their health and wellness. Walking and running are great ways to keep the body healthy and in shape and there’s no better way to incorporate those exercises into your daily routine than through an organized and fun pedometer challenge. There are so many benefits to exercising and we believe that half the battle is getting excited about making a change and then being encouraged to stick with your decision. With the pedometer program, you can share in the experience with fellow workers or be as personal about it as you choose. Wellworks For You also encourages employers to include access to our health coaches as part of their company’s wellness program. If you are connected with a health coach, then they will be your number one cheerleader as you take part in the pedometer program and other company wellness initiatives.